Two glorious live music options tonight as yesterday's Intrepid Show with Delicate Steve (minus Red Baraat) has been postponed until tonight. 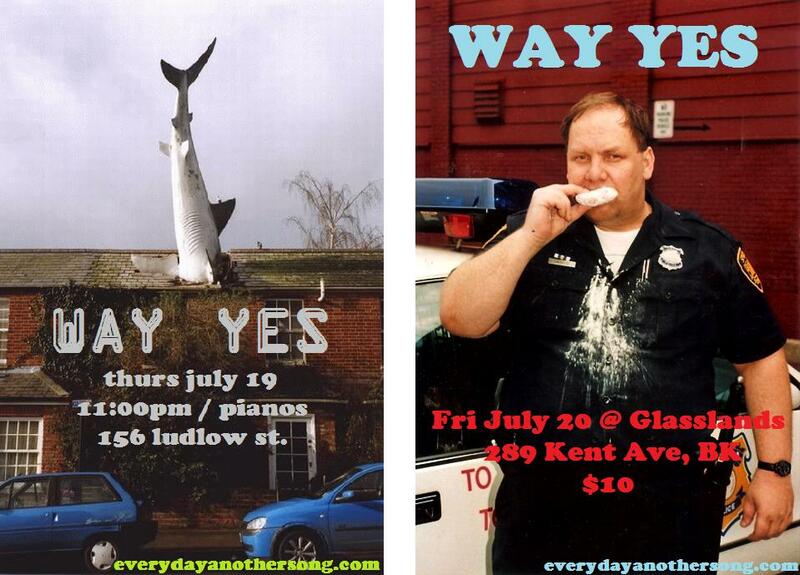 Those who follow #EDAS closely surely remember that today is the first of two area Way Yes shows. Catch the Tropicália fusioneers and all-around nice guys, as they take the Pianos Stage tonight at 11:00PM with support by Strange Shapes, RIMAR and Railbird (tickets here). If you can't make it down to the lower east side tonight, then swing by Williamsburg tomorrow for the early show at Glasslands with Neighbors and Friend Roulette (tickets here). Possible... Nay, probable #EDAS afterparty at a local drinking hole. Follow @EDAS2go for the most up to date info. Definitely come out to enjoy some great unique and worldly heartfelt jams. Here's a Way Yes oldie but goodie. Off their Oranjudio release, here's a great video for Automail. Just watching this vid confirms that these kids bring the fun.